IntelliMagic is a global provider of performance and availability management software and services for enterprise storage environments. IntelliMagic’s software suite for mainframe and SAN environments creates visibility and early warning into hidden risks in critical IT infrastructure resources – enabling proactive performance management. How often have you been stuck in traffic? In many cases, we slowly advance through the gridlock and eventually spot the offending accident or construction work, then off we go. What about when we see no problem? We slow down or stop (sometimes repeatedly), for no apparent reason, then resume just as mysteriously. Not understanding why, is often just as frustrating as the delay itself. The z14 has vast throughput potential. With almost 200 Processing Units (PU's) and 32 TB of cache memory, this is a box designed for massive, parallel processing. So why do the same jobs sometimes take longer? Why do I need to turn on additional engines when transaction rates seems similar? Just as higher speed limits or more lanes don't always solve traffic problems, more MIPS or more memory is not always the answer. In this session, John will share his insights from over 25 years of performance analysis. we will explore common sources of application delays and discuss practical solutions to reduce these delays. Stop the rage. Don't get mad; get moving. Advanced statistical algorithms applied to the most meaningful metrics will automatically identify significant changes to the z/OS workloads and applications, and enable capacity planners to accurately forecast workload growth. This statistical approach, combined with the predictive capabilities of Availability Intelligence, is the most advanced way to understand the performance and availability of the z/OS platform. This webinar will discuss the best practices for managing your replicated tape environment, with particular focus on IBM TS7700 and Oracle VSM environments, so you can properly monitor the performance of your z/OS Tape infrastructure and prevent performance problems before they occur. This webinar will discuss the potential benefits and implications of this revolutionary change to mainframe I/O and help sites determine how zHyperLink fits into the roadmap for their environments. This webinar, which had the highest number of registrations in IBM System Magazine history, discusses and demonstrates the benefits of modernizing how you understand and leverage the SMF data for CICS and Db2 Performance analysis. It highlights how the IntelliMagic approach with automatic health checks and dashboard technology identifies potential performance and availability issues before they impact production. This session will examine the historical reasons why the performance and financial cost impact on the z/OS infrastructure has been difficult to test in DevOps organizations. We will also discuss an architecture and modernized methodology to utilize built-in (artificial) intelligence on the vast infrastructure performance and configuration data (RMF/SMF). This modernized approach can significantly improve release quality as it relates to the z/OS infrastructure’s ability to efficiently deliver the service levels required by specific applications. Outsourcing of z/OS mainframes is not uncommon. Yet there are common application infrastructure performance and capacity related issues for the business that arise in outsourcing situations. 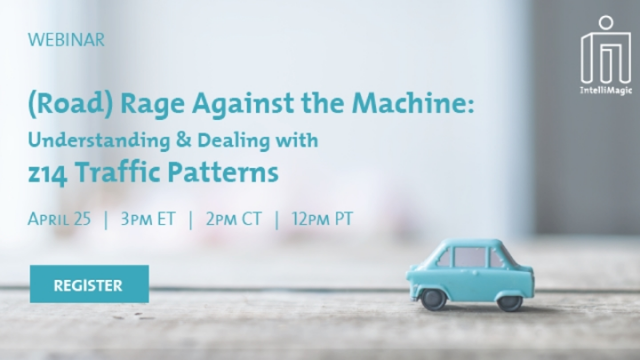 IntelliMagic partners, Cheryl Watson of Watson & Walker and Charles Hinkle of Edge Solutions and Consulting join us in this CMG-hosted webinar to explore these issues and more. Enterprise class data storage technology continues to advance with amazing capabilities, so why do storage problems still disrupt production apps? Led by IntelliMagic's Director of Technical Services, Brett Allison, join us to learn how these issues can be solved. 2018 is a watershed year for how RMF (or CMF) and SMF data is used by Performance and Capacity teams. This webinar covers the smarter analytics trends taking root in the mainstream. Most environments have hidden availability risks because getting insights in the end-to-end risks, from the VMware guest through the SAN fabric to the Storage LUN, is difficult to accomplish in practice. It requires many relationships from a variety of sources. This webinar will cover: • What is the topology viewer? • Requirements for the topology viewer? • What kinds of end-to-end infrastructure storage problems are discoverable with the topology viewer? • How can you diagnose issues with it? • How can I get ahold of it? 24x7 performance from the z/OS infrastructure is more important than ever, but also more difficult than ever using reporting tools designed decades ago. Evolve to intelligent analytics to reduce performance risk, optimize infrastructure costs, and bridge the skills gap.